The beginning of a new year is always a special time – for reflection, for a pause in the hubbub of daily life and for hope for the year ahead. Even though it’s just one of the many days each year, it still feels something like a blank canvas or that crisp, empty page of a new notebook. Boy there’s nothing I love more than the possibilities of a new notebook. While any old notebook will do if the main purpose is simply filling the pages, there’s something extra special about a beautiful notebook. Just like there’s something extra special in the air when the new year starts with a clear blue sky. A moment to be treasured. 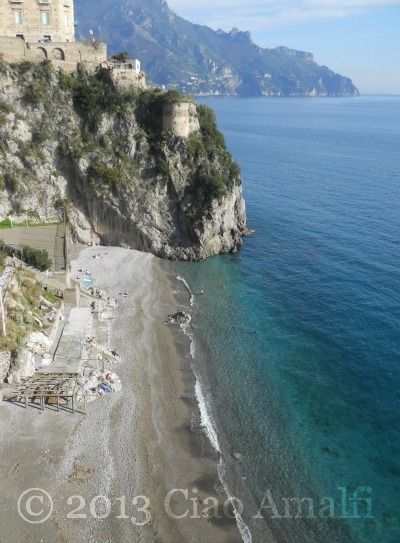 At the beach in Amalfi on New Year's Day! 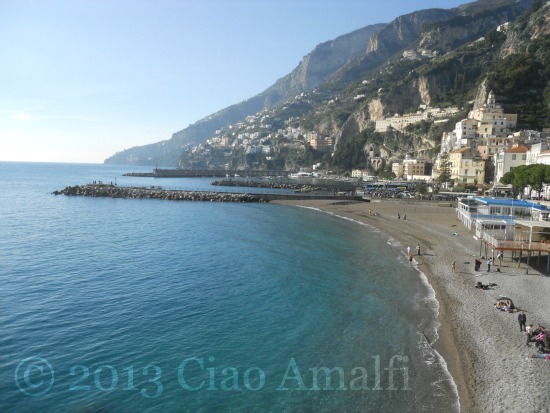 This year New Year’s Day arrived with a brilliant blue sky and warmer than average temperatures on the Amalfi Coast. Before joining family for the traditional New Year’s Day lunch, we enjoyed the sunshine and the start of the new year in Amalfi. 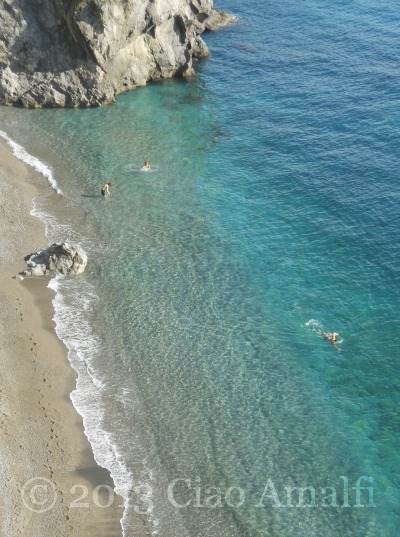 There were people already soaking up the sun on the beach and even a few brave swimmers testing the water. And with the exquisite colors of the sea in the winter you can hardly blame them. It is oh so tempting! After a late night watching the spectacular New Year’s Eve fireworks in Amalfi, a walk on such a beautiful day was the perfect way to start the new day and the new year. 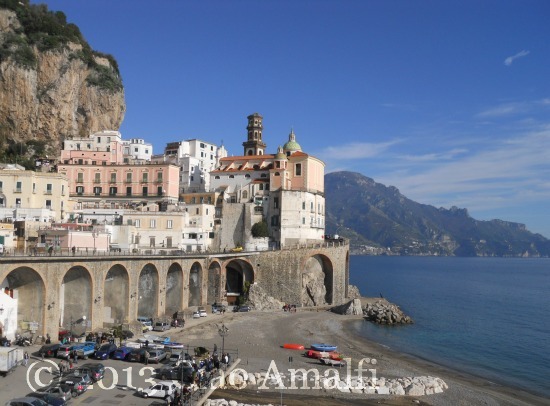 Following the road from Amalfi we headed toward the neighboring village of Atrani. Along the way is the medieval watchtower that is now a part of the Hotel Luna. 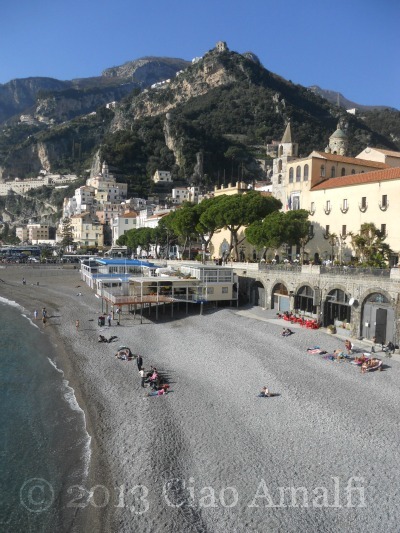 Atrani was looking sleepy and very lovely on New Year’s Day. There was an air of quiet everywhere as the villages awoke to a glorious start to the new year. 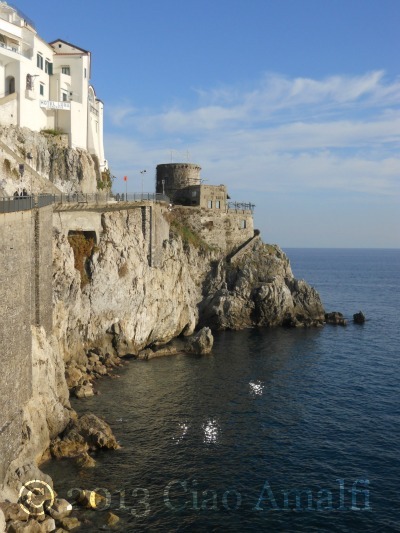 Around the corner past Atrani lies the beach of Castiglione down a winding staircase of a couple hundred steps. It’s a very popular beach in the summer, and even a few people were enjoying the sunshine on New Year’s Day this year. 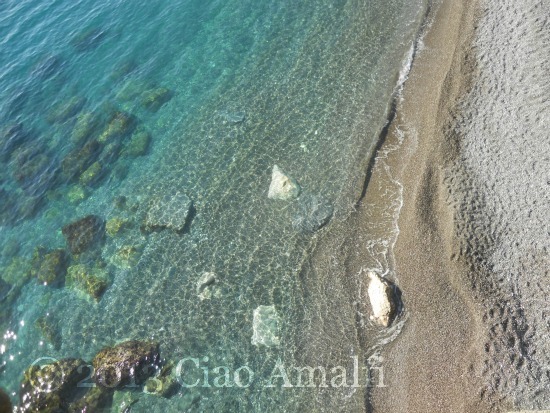 If you’re used to cold water temperatures you can still enjoy a swim in the sea during the winter months on the Amalfi Coast. While there are some locals that swim nearly every day and tourists that brave the cold, it’s not my cup of tea. I’m an admirer of the sea from afar in the winter, which is when I think the colors are the most beautiful. This vivid turquoise is just incredible! I hope your new year is off to a brilliant and happy start! Wishing you a peaceful year ahead filled with many tales to recount in your blank notebook.